Prime Minister Narendra Modi’s visit to Bangladesh is likely to see an contract on India’s participation in the construction of a deep-sea port there. 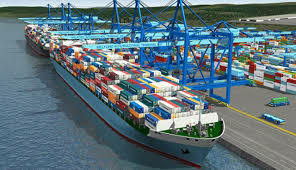 The Port, Payra, will be in Patuakhali district on the Bay of Bengal. The Governments of Britain, Netherlands and China have also shown interest. Officials said a consortium involving different countries could be formed. Currently, Bangladesh has two Ports. With close to 90% of the Maritime Trade being routed through Chittagong Port, its performance has suffered. The 2nd port, called Mongla, handles the remaining trade. The new Port being planned is located between these two. Commodities meant for India’s northeastern states like Tripura are routed through Chittagong and then transported via road. According to the feasibility studies, USD 2 billion will be required to develop Payra Port. To determine India’s participation before Modi’s visit, a delegation of 3 people from the Shipping Ministry recently visited the country and the site. The desired water depth for the new Port is around 14 meters. For the dredging of the approach channel and the initial ancillary infrastructure, the Bangladeshi government has made provision of INR 800 crore.